How to watch It Takes a Man and a Woman (2013) on Netflix Canada! 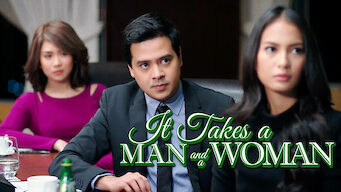 Yes, It Takes a Man and a Woman is now available on Canadian Netflix. It arrived for online streaming on March 8, 2019. We'll keep checking Netflix Canada for It Takes a Man and a Woman, and this page will be updated with any changes. Laida and Miggy used to be in love, but now they're forced to work together in a professional capacity -- and neither is completely over their past. She may be an adept businesswoman, but working with her ex-boyfriend may be more challenging than she had anticipated.